Halifax Transit ferries operate on two routes between terminals in downtown Halifax, Dartmouth and Woodside. The ferry service is accessible, integrated with the bus, carries up to 395 passengers and has adjacent Park and Ride lots. Adult cash fare is either $2.50 or a transfer. The Ferry is about a 10 minute walk from Karen's Bed and Breakfast! Metro Transit becomes Halifax Transit!! another $.50. Make sure to ask for a transfer when you get on the bus at the airport! Metro buses #58, #59, #61 and #68 stop in front of Karen's Bed and Breakfast! Ask the driver to let you off before St George's Lane Tennis Court. Our B&B is at 282 Portland St. Need to cross the harbour? 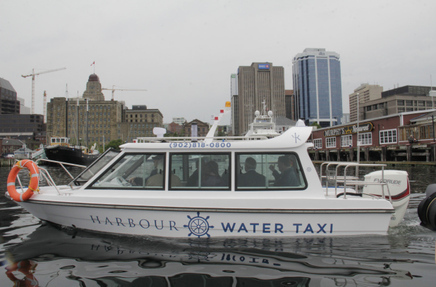 For the first time, residents can hop aboard a new harbour water taxi service from Halifax to Dartmouth, which launched Friday. Earlier in the day, six passengers, including Mayor Mike Savage and King’s Wharf developer Francis Fares –the man behind the water taxi idea – took an inaugural ride on one of the service’s two six- seater boats. “This is new and innovative and I think it’s going to have good take up,” Savage said, standing on the Halifax Harbour, a few minutes after docking from his five minute ride Friday morning. The idea for the service was borne out of Fares noticing a void in what he called a viable business model for water taxis along the harbour, he explained afterwards, adding it cost more than $100,000 to make a reality. Mike Goble, manager of the King’s Wharf marina service area, said one harbour taxi will run on a scheduled service from Monday to Thursday every 20 minutes from Halifax to Dartmouth between 7 a.m. to 10 p.m., Fridays and Saturdays from 7 a.m. to midnight and Sundays between 9 a.m. to 8 p.m. Passenger pick-up and drop off locations are found at the King’s Wharf marina in Dartmouth and near The Wave in Halifax. The cost of a ride is $5 each way. A second boat will also be launched as an “on-demand” service staring July 15, where residents can call and be picked up anywhere along docks in Halifax and Eastern Passage to the Northwest Arm and Bedford, Goble said. As well, the service will provide three scheduled trips to McNabs Island for a round-trip price of $15 on Saturdays and Sundays, staring at 10 a.m.
Goble said the service will hopefully run until October. On Friday, Fares explained this will be a pilot year for the service and hopes it garners enough customers to make it a commercial success and add more boats to the fleet in the years to come. The above map will help you get from the train station to Karen's Bed and Breakfast. Walk to the bus stop indicated on the map. Catch a #41 bus. The Adult fare is $2.50 and the Senior fare is $1.50. (exact change) Ask for a transfer when you pay your fare. The bus will take you to the Bus Depot in Dartmouth by the Sportsplex. Then take any one of the following buses: #58, #59, #61 or #68. Ask the driver to let you off near St George's Tennis Club. That stop will be directly in front of Karen's Bed and Breakfast at 282 Portland Street!